Right Drug, Right Dose, Right Now. Improving outcomes while lowering healthcare costs is just a few clicks away. Grane Rx has launched Medication Insights™, powered by YouScript™, which uses patented technology that can capture 37 percent more drug interactions providing physicians with actionable, personalized drug and dose optimization. Are you ready to learn more? Request a medication insights review now. Unlock the power of precision medicine. With 1 in 3 clinical significant interactions being missed by pharmacy providers, Grane Rx’s Medication Insights™ technology, powered by YouScript™, can quickly identify your patients that are at high risk for hospitalizations and quickly provide medication alternatives to drastically reduce Adverse Drug Events. Unknown Adverse Drug Events can cause many challenges to healthcare providers. With 1 in 8 hospitalizations being caused by ADEs, having a clinical decision support tool to catch those issues at the time of prescribing is critical in reducing hospitalizations. Polypharmacy is a serious danger among the PACE population, since seniors often take a large number of medications to manage multiple health conditions. When taking multiple medications, PACE participants are at an increased risk of drug interactions and other adverse drug events. What if there was a solution that uncovered potential interactions before a prescription is even electronically transmitted to the pharmacy? There is. Medication Insights™ provides that solution. 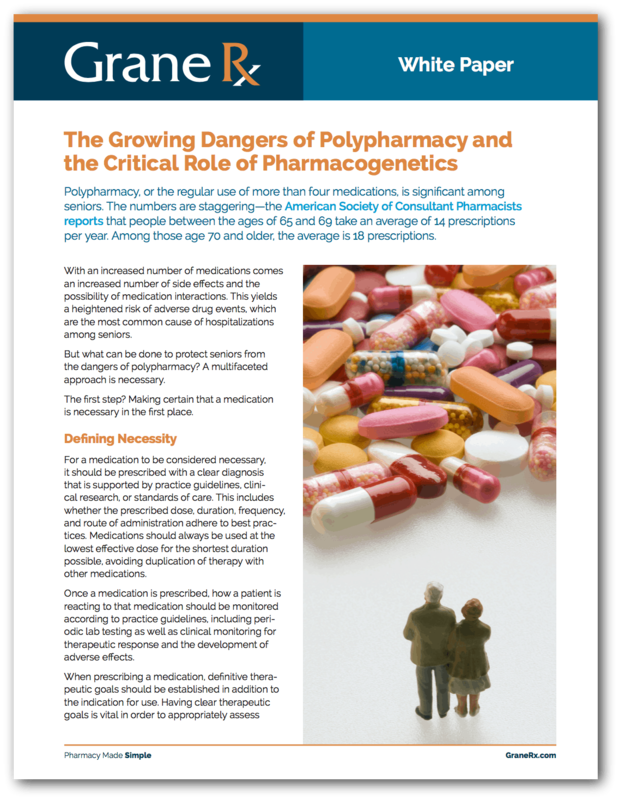 Download our whitepaper to learn more about the dangers of polypharmacy and how Medication Insights™ can help limit those dangers. 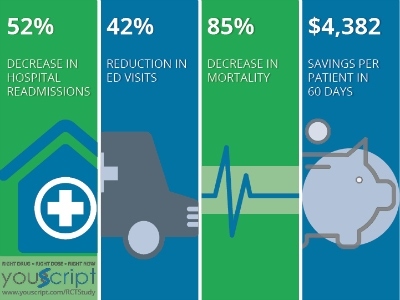 This study found that patients receiving pharmacogenetic testing and treated according to the YouScript Personalized Prescribing System had a significant decrease in readmissions and emergency department visits, resulting in potential for cost savings. Schedule your free Medication Study now. Enter your contact information below and our team will be in touch.